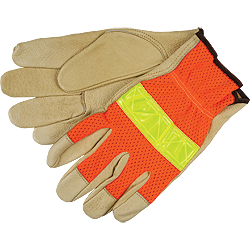 MCR Safety strives to create the most comfortable and durable leather products on the market. 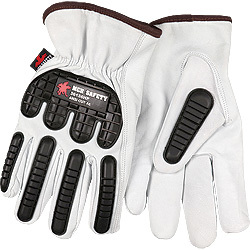 The 36136HP includes goatskin that provides extreme comfort and dexterity. This supple leather contains natural lanolin that helps create a very soft feel. Characteristics include strongest tensile strength and excellent tactile sensitivity. Best combination of flexibility and comfort. The 36136HP features select grade grain goatskin leather, shirred elastic back, and keystone thumb. The 36136HP includes a Hypermax™ liner that gives outstanding cut protection. The TPR on the back of the glove will assist with impact.